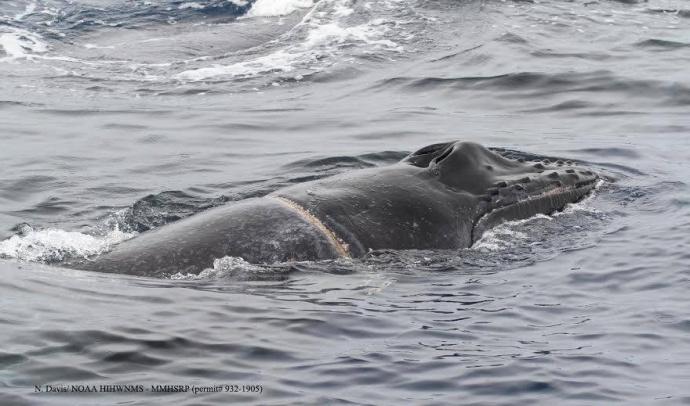 Response crews successfully disentangled a whale calf on Wednesday from line that was tightly wrapped around its body, the Pacific Whale Foundation reports. The whale was one of three found in as many days that were in need of rescue, according to PWF spokesperson Anne Rillero. The Pacific Whale Foundation reportedly sighted the calf on Sunday, Dec. 15, and the PWF’s Ocean Odyssey vessel helped to monitor the calf on Wednesday afternoon, Dec. 18, until a rescue team arrived. Photo courtesy: NOAA, HIHWNMS (permit 932-1905). Using a specially designed knife, members of the Hawaiian Islands Entanglement Response Network were able to free the whale at around 4:21 p.m., PWF representatives said. 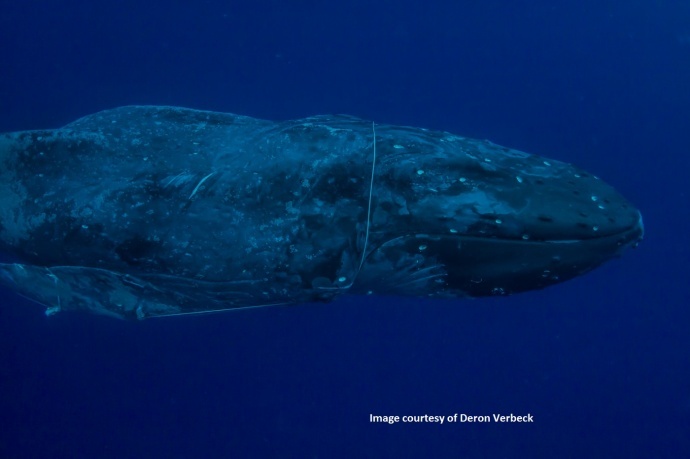 According to information released by the PWF, the entanglement, which was located just forward of the calf’s pectoral fins, was considered life-threatening because of the rapid growth of the animal. Ed Lyman, the Large Whale Entanglement response coordinator at the Hawaiian Islands Humpback Whale National Marine Sanctuary was credited with the disentanglement, along with other response team members, which included trained personnel from the Sanctuary, the NOAA Corps, NOAA Fisheries, and the US Coast Guard. 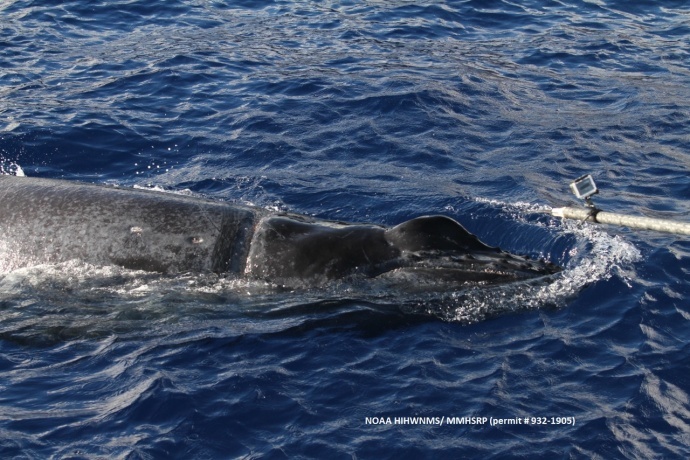 The team worked aboard the Hawaiian Islands Humpback Whale National Marine Sanctuary’s response vessel, Koholā. Upon sighting the whale on Sunday, Pacific Whale Foundation’s captain and naturalists called Lyman and monitored the whale until the rescue team arrived. “A response effort was conducted by the trained and authorized team represented by the Hawaiian Islands Humpback Whale National Marine Sanctuary, NOAA Corps, NOAA Fisheries and Kaho’olawe Island Reserve Commission, Pacific Whale Foundation and Ultimate Whale Watch,” Lyman reportedly said in a follow-up email about the rescue attempt. On Wednesday, Dec.18, the calf was located by Captain Pat Stenger from the vessel Na Pali Explorer, about 3/4 mile off the coast of Lāna’i near Mānele Bay. 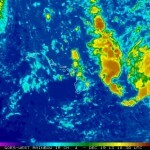 NOAA was contacted and the Safari Explorer sent out one of their skiffs from Mānele to help monitor the calf. 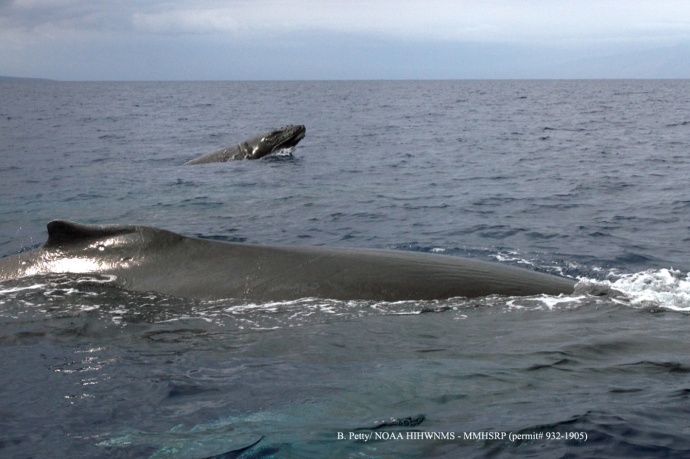 The Na Pali Explorer and Trilogy IV also helped to monitor the whale until NOAA arrived. 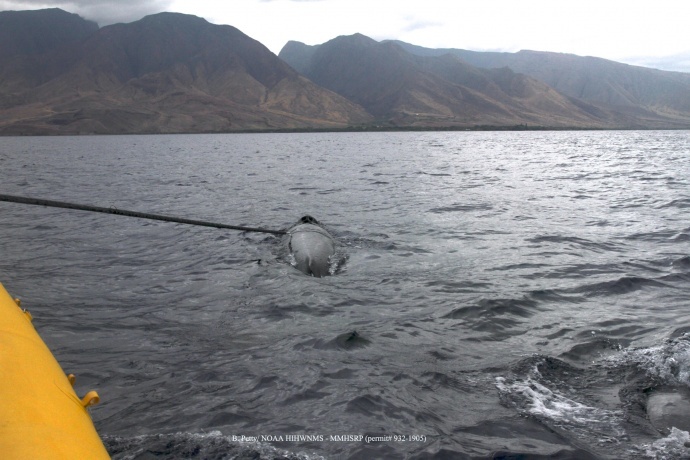 In a follow-up report, Lyman offered special thanks to Grant Thompson for designing and fabricating the knife that cut the animal free; the US Coast Guard for their continued assistance; and Maui Adventure Cruises vessel, Explorer, Safari Explorer, Hawaiʻi Whale Research Foundation, and the Pacific Whale Foundation’s Ocean Odyssey for working together to monitor the animal while a response was mounted. Mariners are asked to keep a look out for two other whales, described as sub-adult humpbacks, that the PWF said were in need of help. One of the whales was spotted on Saturday, Dec. 14 with an injured fluke about three miles off of Launiupoko during an afternoon whalewatch. Another whale was spotted on Monday, Dec. 16, with several wraps of red-colored, small gauge line around its tail-stock and fluke blades, with another 60 feet of trailing line. The condition was considered “life-threatening,” according to the Pacific Whale Foundation. Marine biologist Lauren Campbell, who serves as the conservation manager at the Pacific Whale Foundation, said an average of seven whales are confirmed entangled in Hawaiian waters each winter. “We’re a little over a month into our whale-watch season at Pacific Whale Foundation and already our vessels have confirmed four entanglements in Maui County waters,” she said in a report posted on the Pacific Whale Foundation”s website. The multi-agency response team, led by Lyman, has mounted nearly 130 responses in Hawaiʻi, and freed 17 whales to date, according to the Hawaiian Islands Humpback Whale National Marine Sanctuary. 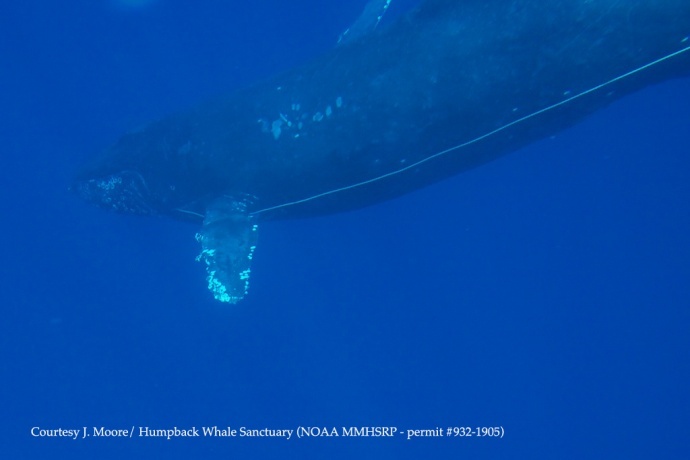 In March, the Hawaiian Islands Entanglement Response Network successfully disentangled a humpback whale stuck in fishing gear and line in waters off of Maui. 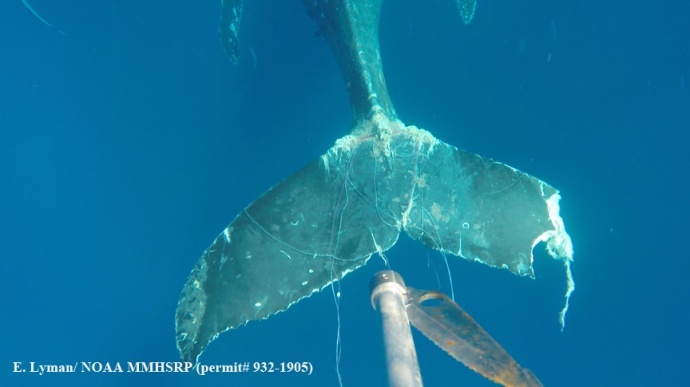 If an entangled whale is spotted, the PWF advises the public to contact the NOAA Fisheries Hotline at (888) 256-9840. 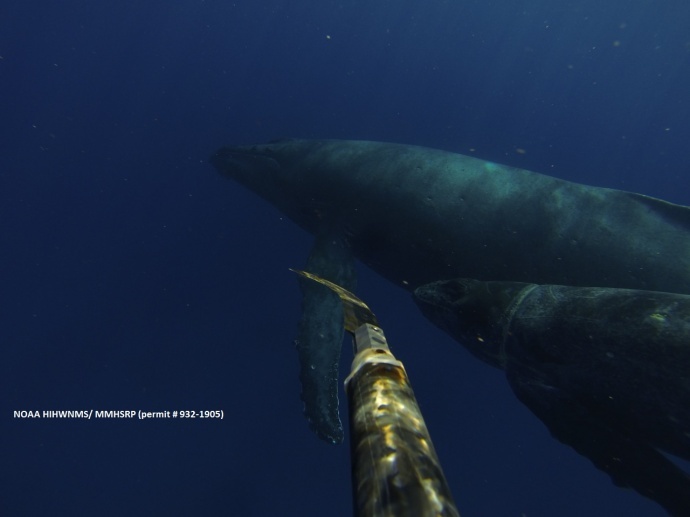 The PWF suggests that as much information be collected about the whale as possible, including photos and videos to allow for better assessment of the situation by response teams.